Take command of your most demanding enterprise applications with high-performance, low-latency, solid-state drive (SSD)-based Dell™ EqualLogic™ PS6110S 10GbE Internet SCSI (iSCSI) arrays. Take command of your most demanding enterprise applications with high-performance, low-latency, SSD-based Dell EqualLogic PS6110S 10GbE iSCSI arrays. Master your data-hungry tasks with EqualLogic™ PS6110S high-performance, low-latency 10GbE iSCSI arrays for highly consolidated enterprise environments. Experience the low-latency advantage of solid-state storage with the PS6110S 10GbE iSCSI array. It’s a Dell Storage solution with a virtualized scale-out architecture that delivers enhanced storage performance and reliability that is easy to manage. Help eliminate manual redistribution of capacity or application workloads (downtime and services costs). 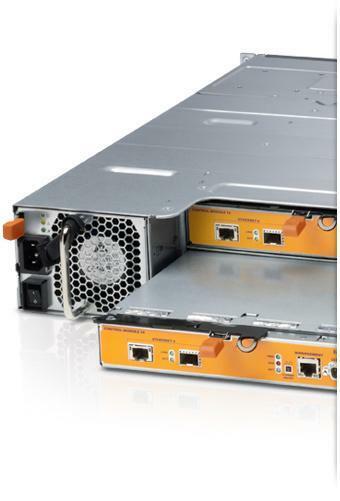 Dual 10GbE controllers and dual power supplies designed for built-in redundancy. Dedicated 10/100 management port per controller.